Do you need ideas for super easy camping recipes? LET US HELP YOU PLAN SOME EPIC MEALS. 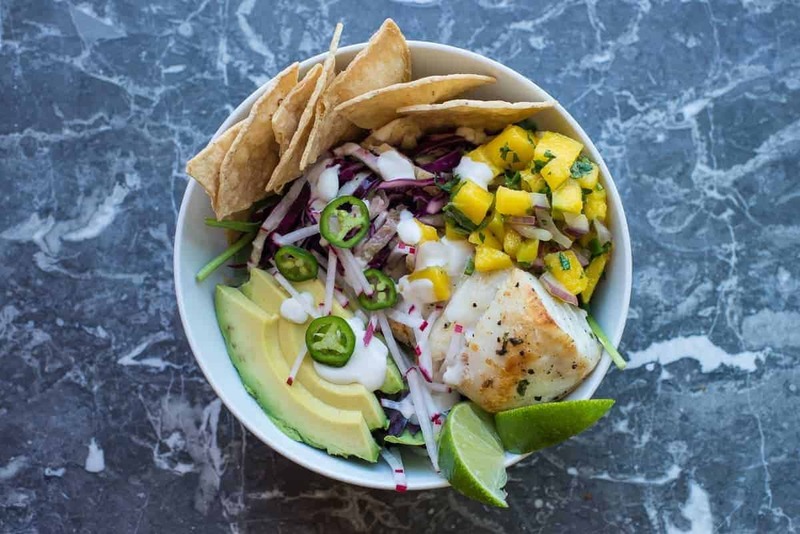 See All The Recipes Now! I love everything about camping. I love the fresh air. I love waking up to the sounds of animals all around me. I especially love campfires. 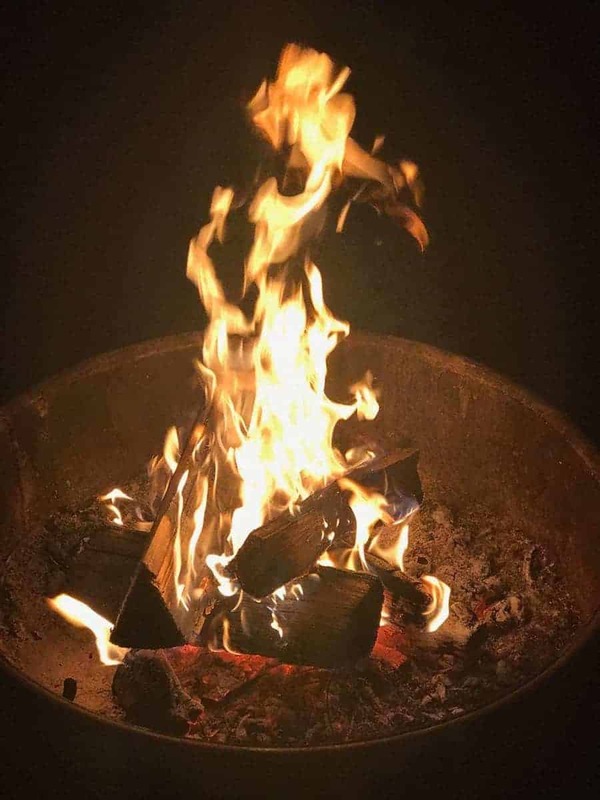 It might just be because I’m a fire sign but I find the sound and smell of a roaring campfire to be one of the most relaxing and meditative experiences available. 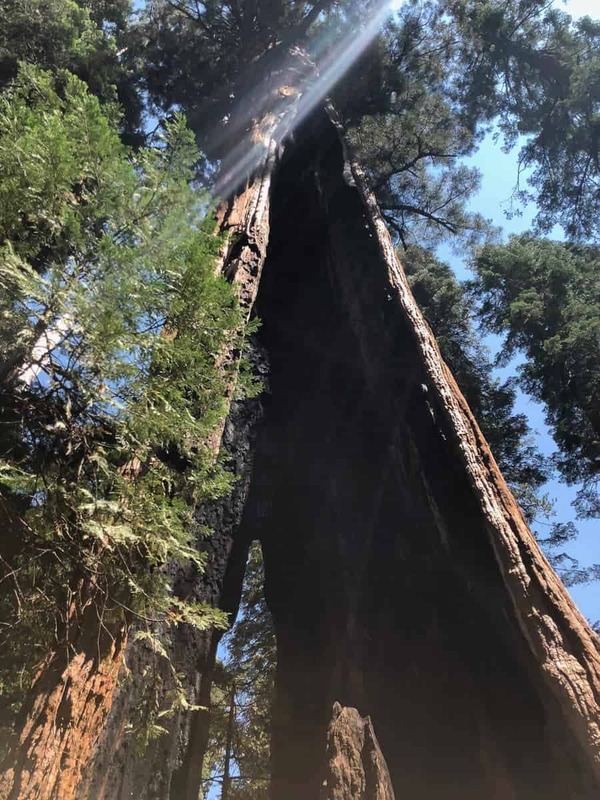 My husband and I just got back from a 4 day 3 night camping trip in Calaveras – Land of the Big Trees. We hiked all around and marveled at the fact that most of the trees that we were sharing company with had been standing right there in that spot for hundreds – and some thousands – of years. Can you comprehend thousands of years? These giant trees were mere infants when Native Americans first inhabited these lands. Then they continued to stand right here while wars were fought over these territories. These trees were standing right here through famine and plagues. It’s so humbling to think how our lives are just a blip on the landscape of all eternity. Here these trees have stood thousands of years before me and they may be standing thousands of years after I’m gone. Of course, that’s why you’re here. When I go camping I still want to eat real food. None of this prepackaged space food full of nasty preservatives. How do I do this? First, I pre-plan all my proteins, season them, vacuum seal them, and freeze them. Next, I pre-cut any veggies and/or measure grains that I might need (with the exception of potatoes) and vacuum seal these. I store these in the fridge. This is my vacuum sealer. I also use these food containers for pre packing. A set of pans including; a small to medium sized skillet (I love cast iron but you can use a lighter non stick variety), a small sauce pan, a larger sauce pan, a cast iron dutch camp oven. And a lid lifter. Coffee pot and coffee cups. I packed oatmeal and Kodiak protein pancakes. These are both easy to make on the camp stove. I packed some real maple syrup – cuz Ms. Butterworth just won’t do. 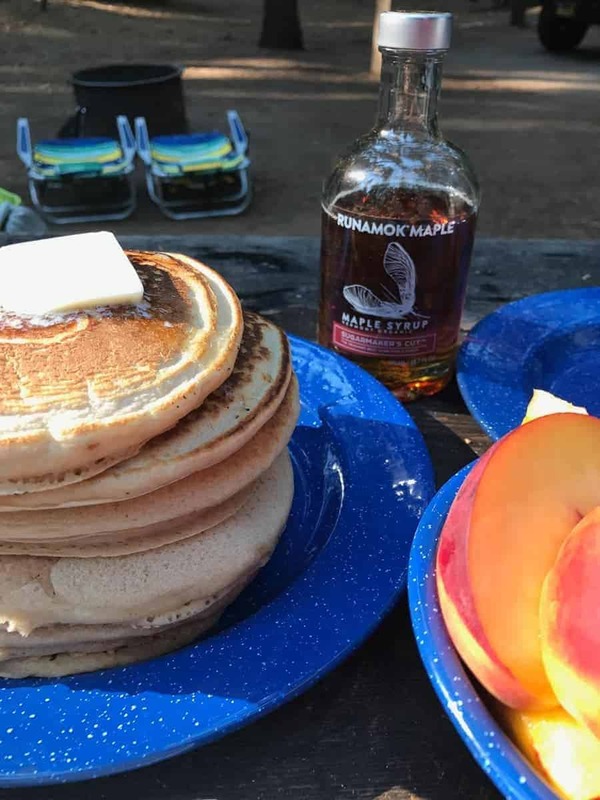 I found this delicious maple syrup and my local store from Runamok. I highly recommend it. Unfortunately, I forgot my peanut butter on this trip 😢. I love my pancakes with peanut butter and maple syrup. Don’t knock it ’til you try it! So yummy, and the peanut butter really gives the pancakes some staying power with a healthy serving of fat and protein. We also did breakfast burritos one morning. (Sadly I forgot to snap any photos of these amazing tasty breakfast treats.) I scrambled some eggs, and sage sausage. Then I added some avocado and cotija cheese. Fresh fruit is also essential for camping. Peaches are super ripe right now so I packed mostly peaches and a few oranges for the trip. As a go-to for on the road fueling, I pack beef jerky and Kind bars. They are easy to throw in a back pack for the day. Because we’re mostly out exploring during the days, I don’t usually plan on cooking for lunch. I did however know we would need lunch on the first day. 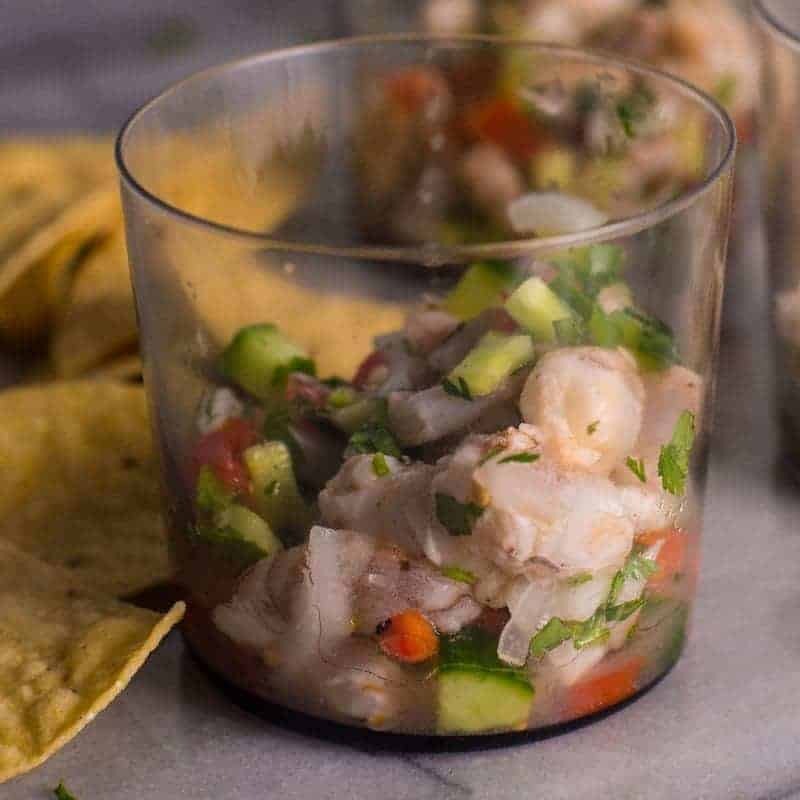 For this first lunch I made shrimp ceviche. I knew after setting up the tent that we would be hot. I figured that something cold would totally hit the spot. 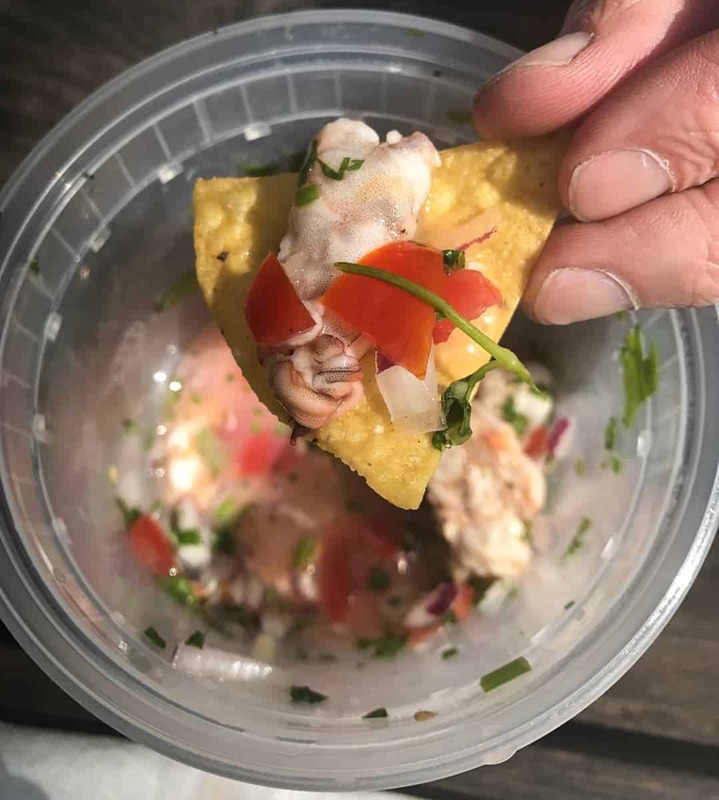 Shrimp ceviche was something we could eat right away, ice cold, with some crunchy tortilla chips. It would be delicious, refreshing, and most importantly, not require any additional preparation. The second day we had a short hike planned to one see of the largest trees in the park, Aggasiz. This tree stands 250 ft tall and is more that 25 ft in diameter. It’s a wonder to see. 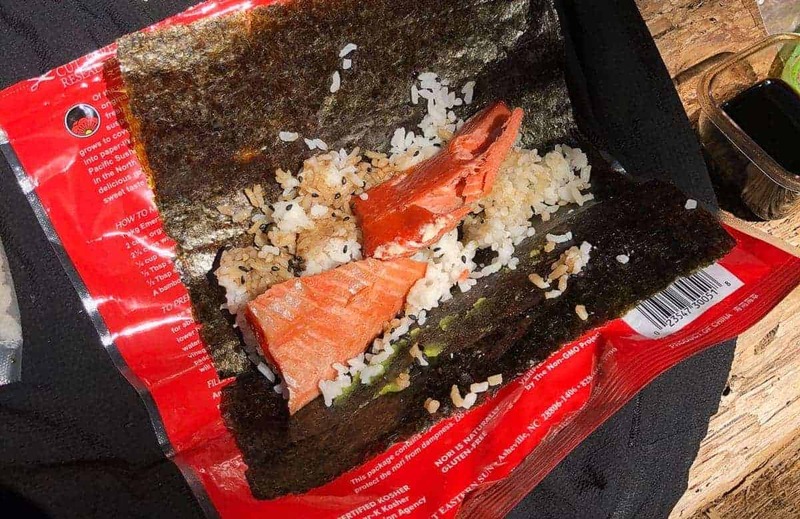 For this lunch, I packed the component parts for smoked salmon hand roll sushi Jump to Recipe . 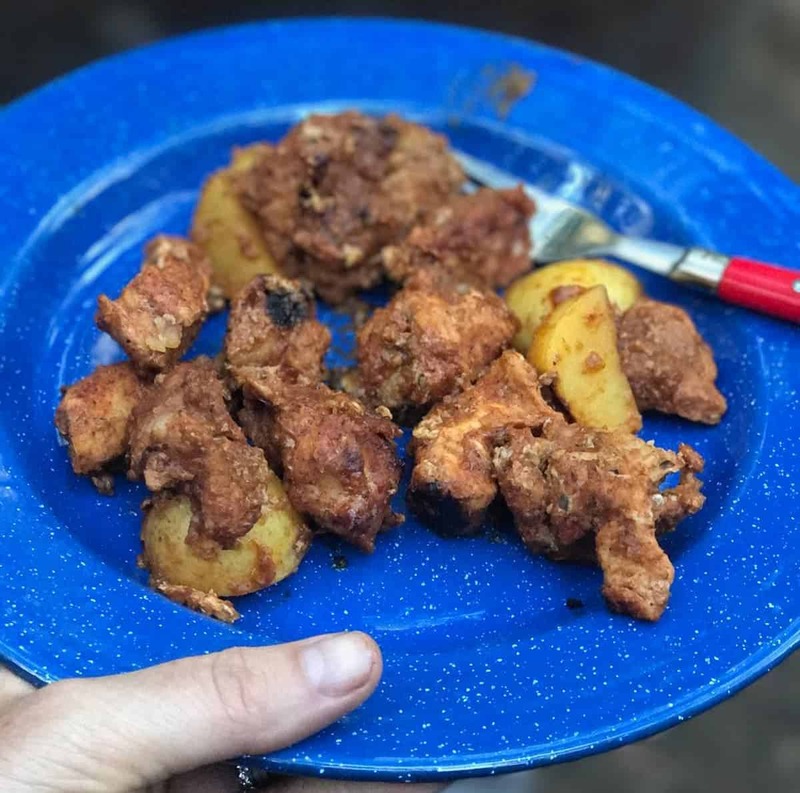 It’s super easy to make and eat out in the field. The smoked salmon is already cured and packed. You only have to open it when you are ready to eat. 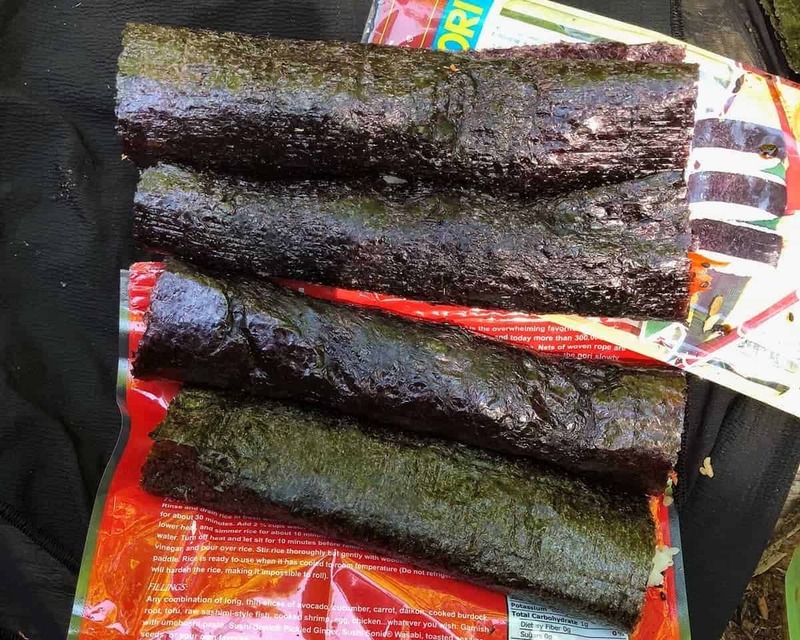 Nori sheets are already dried. The only thing I had to pre-make was sushi rice. I made this rice at home ahead of time, packed it in an air tight container, and kept in the fridge. Then it stayed nice and cold in the cooler until we where ready to use it. Then, I threw all the fix-ins: including some wasabi, a small container of soy sauce, and some black sesame seeds into my backpack and off we went. I felt like seeing the largest tree in the park called for a lunch that was a little more special than just some packaged jerky. It was the most memorable lunch we had. 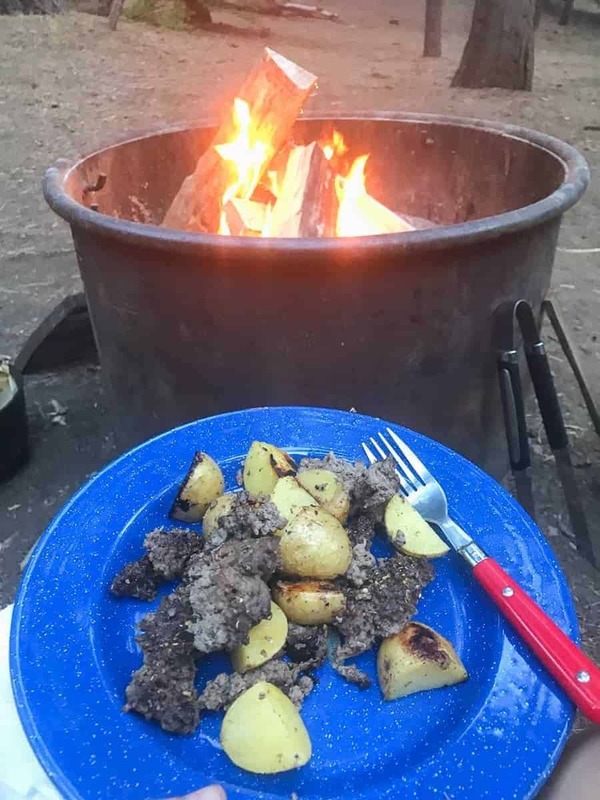 Dinner is always special around the campfire. For this trip’s dinner line up, I prepped beef fajitas and a pork roast. Jump to Recipe The beef fajitas were delicious and super easy to pull together as I had pre-prepped all the meat and veggies at home. Dinner on the second night was my personal favorite. I did a pork club roast with peach bourbon barbecue sauce and yukon gold potatoes Jump to Recipe . This was all cooked directly in the fire in my lodge campfire dutch oven. Amazing!!!! Clean up was also a breeze thanks to the parchment liners. While we ate dinner I put a peach crumble in the campfire dutch oven. I pre-prepped the gluten free crumble and vacuum packed it at home. I then kept it in the cooler until ready to use. 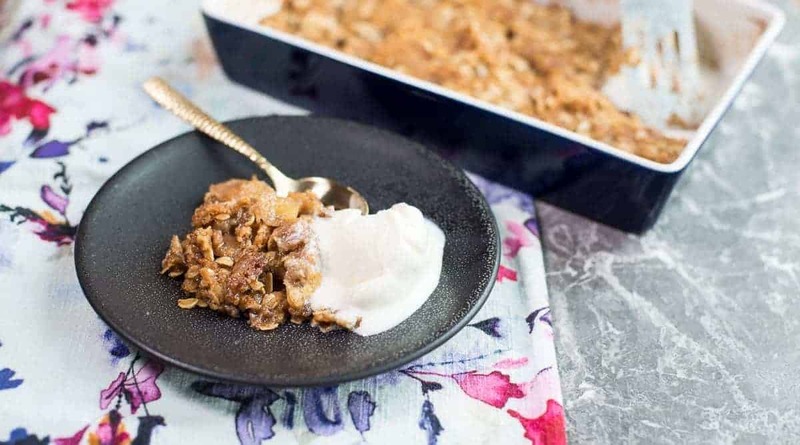 You can use this crumble with any fruit. I peeled and diced 4 peaches for this recipe, yielding about 3 cups of fruit. The whole thing cooked while we ate dinner. It was ready to pull off the fire and enjoy in just 20 minutes. My husband was so impressed. It came out hot and bubbly with a rich caramel sauce and a a slightly browned cinnamon-y oat topping. Talk about camping in style! For our last night of camping I made a super simple campfire hash. Also prepared in the campfire dutch oven. This was simply ground beef, Yukon gold potatoes, onions, salt and pepper and some Italian seasoning. Honestly I would have done this a little differently. That’ll have to be another post. It was tasty but I already have some ideas on how to level this up a notch. Take 1 cup of cooked sushi rice and add 1 tbsp rice vinegar. Stir with rice spatula until incorporated. Lay out a sheet of nori and add about ¼ of the rice. Use fingers to press the rice onto the sheet of nori. Add smoked salmon, wasabi (optional), soy sauce and a sprinkling of sesame seeds. 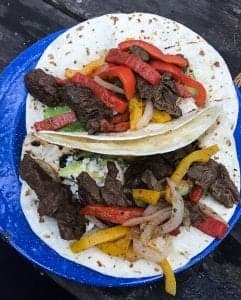 Slice hanger steak, sprinkle with taco seasoning. Vacuum seal and freeze. Slice veggies, vacuum seal and refrigerate. Heat a pan on medium high on a camp stove. Add veggies and cook to desired doneness. Add meat and veggies to tortillas. Add avocado, cotija cheese and hot sauce. Add dry ingredients to a bowl. Mix to blend together. Add cubed butter and toss to coat. Add crumble mixture to a vacuum bag and seal. Store in the refrigerator. 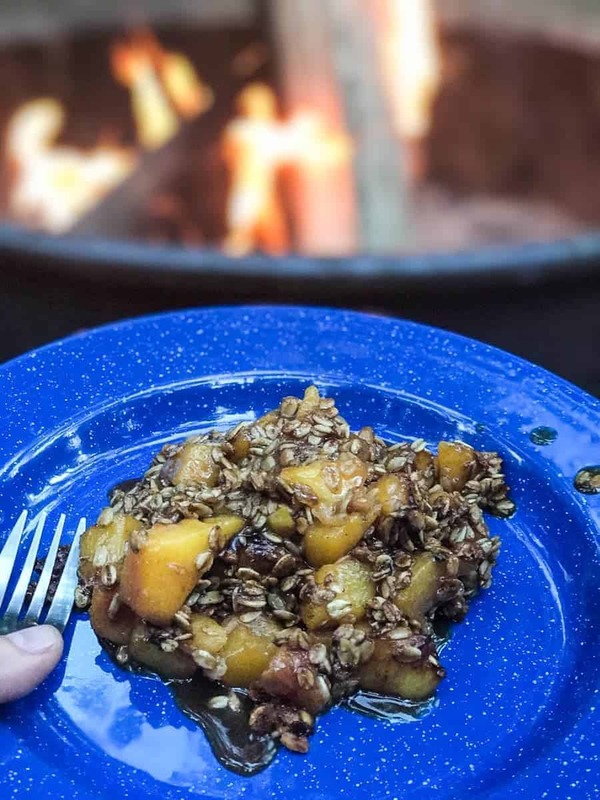 Add 3 cups of fruit to a parchment lined campfire dutch oven. Start a charcoal fire in your fire pit. 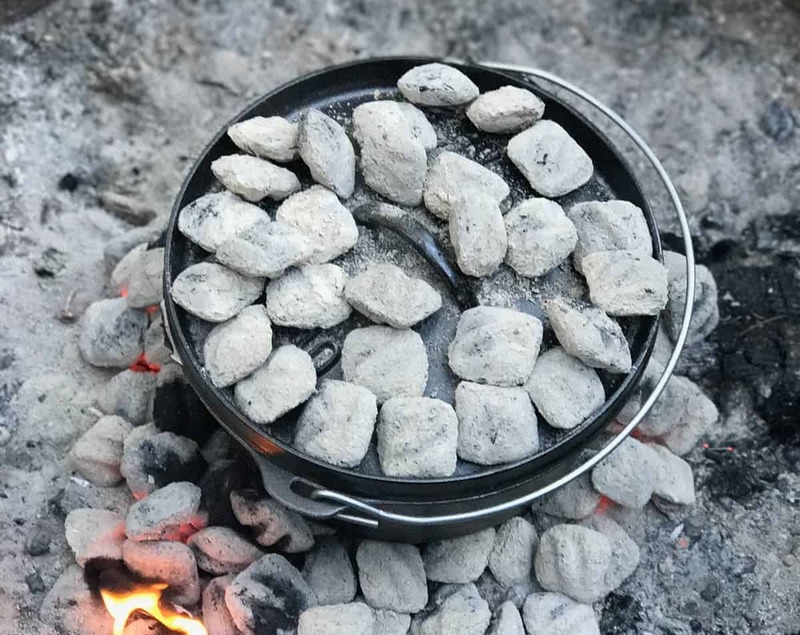 Once coals are white hot, spread them out and add campfire dutch over to the fire. Cover the top with hot coals. Cook for 20 minutes. Check to see is sauce is bubbly and oats are brown. If not cook a little while longer. When everything is bubbly and brown, remove entire dutch oven from the fire. Add some wood to the fire and watch it burn. This recipe is super basic. You can add other vegetables like bell peppers if you like. Add all ingredients to a parchment lined campfire dutch oven. Crumble meat so that it is evenly distributed amongst potatoes and onions. Make a charcoal fire in your fire pit. Once the coals are white spread them out and nestle the campfire dutch oven in the hot coals. Cover the lid with hot coals and cook for 20 minutes. Remove lid and check the doneness. Once it is done remove and serve.